Happy New Year to all…we had a long night at the annual Volunteers night on Saturday, thanks to all for organising and those who supported it. Lotto There was no winner of the lotto on the 3rd January; Numbers were 11, 18, 20 and 22. Next weeks’ jackpot €9,000, draw will be managed by Diarmuid Dawson and is sponsored by Coláiste Laichtín, Inis Oírr. Lucky Dips Winners: Joe+Alice Whyte, Cormac Gordon, Niall Rigney, Alan Carey, Brendan Donoghue. Play Online here, Or Tickets can be purchased at the Club, or in Kenny’s Vesey Arms. We are delighted to confirm Ed O’Brien as the new Junior football manager, Ed will be joined by Mick Casey, Tom Birch, Mick Cuffe and Davey Brien; also Paul McGann and Dara Keher are remaining on. We are of course very grateful to Donal Crowley, Pat McCabe and Ollie Collins who stepped away after a number of years with the team, they put in a lot of good work and lets hope this new management team can build on that success. Also we are pleased to announce the new Minor A and B Hurling managers are Dermot English and John Egan respectively and also we are very glad to announce that Dermot O’Brien has stepped up from Minor A manager to take the Junior A hurlers. We wish them all success’ in their roles. We wish our Senior Camogie players Ali Twomey, Jessie McClelland and Emma Flanagan all the best for the year ahead with the Dublin Senior Camogie , hopefully they can build on the foundations of the last 2 years. Also on the Ladies football side we wish the girls well as the inter-county squads have been confirmed for the year ahead. Best of luck to all the girls and the club is always proud to have players wearing the blue jersey. 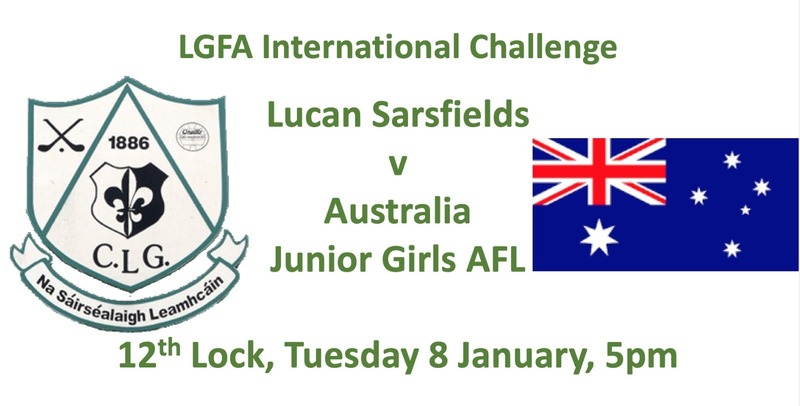 Don’t forget the LGFA international challenge match is on at 5pm on Tuesday and it would be great to have lots of support up to offer a Céad Míle Fáilte to our Australian friends after the game.